Li-Fi 100 times faster than Wi-Fi – COME MAKE IN INDIA.SELL ANYWHERE AROUND THE WORLD. Expect to hear a whole lot more about Li-Fi – a wireless technology that transmits high-speed data using visible light communication (VLC) – in the coming months. With scientists achieving speeds of 224 gigabits per second in the lab using Li-Fi earlier this year, the potential for this technology to change everything about the way we use the Internet is huge. And now, scientists have taken Li-Fi out of the lab for the first time, trialling it in offices and industrial environments in Tallinn, Estonia, reporting that they can achieve data transmission at 1 GB per second – that’s 100 times faster than current average Wi-Fi speeds. “We are doing a few pilot projects within different industries where we can utilise the VLC (visible light communication) technology,” Deepak Solanki, CEO of Estonian tech company, Velmenni, told IBTimes UK. Li-Fi was invented by Harald Haas from the University of Edinburgh, Scotlandback in 2011, when he demonstrated for the first time that by flickering the light from a single LED, he could transmit far more data than a cellular tower. Think back to that lab-based record of 224 gigabits per second – that’s 18 movies of 1.5 GB each being downloaded every single second. And while you might be worried about how all that flickering in an office environment would drive you crazy, don’t worry – we’re talking LEDs that can be switched on and off at speeds imperceptible to the naked eye. The benefits of Li-Fi over Wi-Fi, other than potentially much faster speeds, is that because light cannot pass through walls, it makes it a whole lot more secure, and as Anthony Cuthbertson points out at IBTimes UK, this also means there’s less interference between devices. While Cuthbertson says Li-Fi will probably not completely replace Wi-Fi in the coming decades, the two technologies could be used together to achieve more efficient and secure networks. Our homes, offices, and industry buildings have already been fitted with infrastructure to provide Wi-Fi, and ripping all of this out to replace it with Li-Fi technology isn’t particularly feasible, so the idea is to retrofit the devices we have right now to work with Li-Fi technology. Research teams around the world are working on just that. 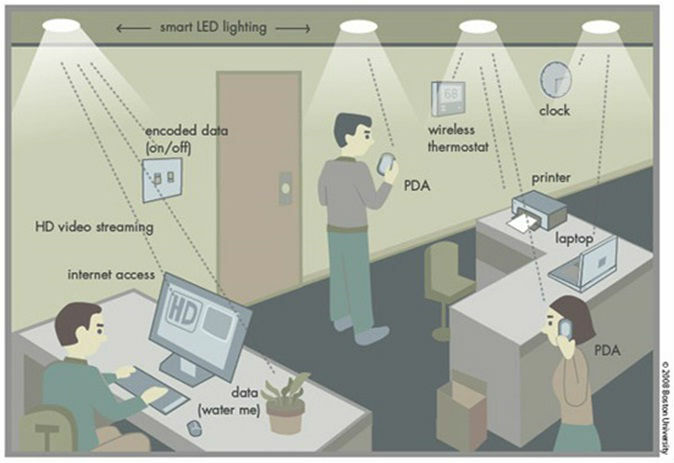 Li-Fi expertsreported for the The Conversation last month that Haas and his team have launched PureLiFi, a company that offers a plug-and-play application for secure wireless Internet access with a capacity of 11.5 MB per second, which is comparable to first generation Wi-Fi. And French tech company Oledcomm is in the process of installing its own Li-Fi technology in local hospitals. If applications like these and the Velmenni trial in Estonia prove successful, we could achieve the dream outlined by Haas in his 2011 TED talk below – everyone gaining access to the Internet via LED light bulbs in their home.